Sony has filed with the U.S. Patent and Trade Office for a two-screened tablet that rotates on multiple axes, meaning the screens can be configured a number of ways. By utilizing some clever hinges and a pinch of magic dust, the new device would allow users to flip the screens around to have them next to or on top of one another. In short, a "connection apparatus," as the patent filing puts it, allows two "casings" to be "rotated relatively in one of a first rotation direction and a second rotation direction orthogonal to each other between a first state and a second state." The filing itself is filled to bursting with detailed and indecipherable technical descriptions, though suffice to say Sony's got all the bases covered in this patent. Sony's hardly the first to come up with a folding dual-screened device. Nintendo's DS line of handheld gaming systems, including the new 3DS XL, has been folding since 2004. Microsoft came up with a "Courier" concept that was scrapped in 2010. And Apple's latest patent—though technically dissimilar—puts a second display on the iPad's folding Smart Cover. Even Sony's own Tablet P, released in 2011 to mixed reviews, features two wide screens on top of one another with a hinge in between. 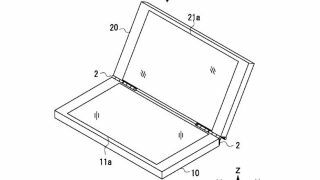 But the Japanese company's new patent filing focuses almost entirely on the hinges themselves, and it may in fact be the first to feature the sort of "Jacob's Ladder" (as Engadget puts it) design. But what's the actual use? There are plenty of reasons to want to configure the screens one way or the other. One configuration might be best for typing or playing games, for example, while the other will be preferable for reading or browsing the web. Still, this new Sony patent comes across as fairly gimmicky and somewhat impractical, so it will be interesting to see if it ever comes to fruition.